By far the best roast chicken recipe I’ve ever done. Luxurious, silky creme fraiche slathered all over a perfectly roasted, super juicy bird. Slightly adapted from The Standard Grill. Preheat oven to 450 degrees F. Use a baking vessel that’s big enough to contain all of your chicken(s). In a small bowl or container, mix three tablespoons of kosher salt, one tablespoon of herbs de provence, and 1 teaspoon of black pepper together. This will be your seasoning blend. Drizzle about 3 tablespoons of olive oil in a large baking dish, stainless steel, or cast iron skillet. Layer the sour dough bread on the bottom. Pat the skin of the hens dry with paper towels. Sprinkle a generous amount of the seasoning blend into the cavity of each hen. Stuff 3 sprigs of thyme, 1 sprig of rosemary, 1 smashed garlic clove, 1 bay leaf, and one slice of lemon into each hen. Drizzle about a tablespoon or two of olive oil all over the skin of each hen, then sprinkle more of the seasoning blend all over the surface of the bird. Truss the legs together with kitchen twine, and place each hen on top of the sourdough bread slices. Place the hens and bread into your preheated oven on the middle rack, and roast uncovered for 50 minutes. Meanwhile, mix all of the Million Dollar Sauce ingredients together in a medium bowl until well combined. Set aside in the fridge to chill. After 50 minutes, remove the hens from the oven. Slather each hen with the Million Dollar Sauce very liberally. It will melt like butter almost instantly. Pop the hens back into the oven for just 10 minutes. After 10 minutes, remove from oven, turn off the heat. Slather them again and put them back into the hot but turned off oven for about 5 to 10 more minutes. Remove from oven and allow them to rest for at least 10 minutes. Meanwhile, pour the remaining Million Dollar Sauce into a small saucepan or skillet and simmer over medium heat for about 2 to 3 minutes. Pour into a small serving dish, and serve alongside the hens. Serve the hens with a slice of the caramelized bread (if you want), and more Million Dollar Sauce for drizzling. Enjoy! 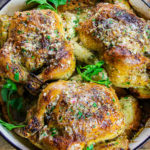 You can make this recipe with one or 5 cornish hens – quantity doesn’t matter here. You could also use a larger whole chicken instead. I’m giving you measurements based on what I used exactly, but as always, adjust the ingredient amounts according to however many or types of chicken you choose. If using cornish hens, make sure you use enough bread on the bottom to cradle each one. If using a whole chicken, two to three large slices should suffice. Of course, you can totally skip the bread altogether. I swear, this chicken is so good on it’s own it really doesn’t matter.